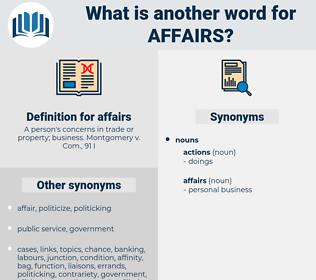 What is another word for affairs? advisers, commissions, situations, Fisheries, Families, Risks, Investments, Lives, Regulations, tasks, consumers, practices, Undertakings, managers, Economies, panels, regions, arrangements, Opportunities, Canadians, Ros, SDS, officers, sexes, complaints, projects, Forms, claims, documents, subjects, men, Studies, utilities, accounts, Countries, makes, considerations, Consultants, Rights, Resources, fighters, Areas, ratios, Inquiries, aspects, connections, Duties, linkages, Veterans, supplies, IGS, combatants, ties, 'affaires. appropriations, considerations, Consultants, Rights, Resources, fighters, Areas, ratios, Inquiries, aspects, connections, Duties, linkages, Veterans, supplies, enquiries, highways, IGS, IGSS, combatants, ties, concerns, Bodies, Queries, Goals, women, events, media, Students, 'affaires. representatives, advisers, partnerships, interrelationships, responsibilities, transformations, Histories, interventions, coordinators, investigations, commissions, situations, Religions, authorisations, Charges, interrelations, personals, discussions, factors, spheres, Families, dossiers, assignments, principles, Crises, delegations, clarifications, jobs, reforms, interactions, scandals, purposes, foreigners, officials, prosecutions, positions, deliberations, Expenditures, gatherings, Associations, Specialists, Lives, Regulations, tasks, initiatives, sectors, entrepreneurs, posts, provinces, elections, Crimes, proposals, Firms, possessions, Indians, Forums, desks, stakeholders, trade-offs, Referrals, practices, competences, Undertakings, experiences, materials, managers, Realities, Measures, panels, accusations, incidents, procedures, engagements, shops, trials, regions, instances, circles, abuses, implications, arrangements, Possibilities, Opportunities, systems, Hearings, priorities, Difficulties, adventures, sites, functions, statements, officers, allegations, Achievements, Friends, substances, partners, skills, facts, chores, decisions, Hypotheses, Communities, Arenas, shares, requirements, Stories, indictments, actions, exchanges, revenues, references, markets, reasons, locations, features, sets, assumptions, Records, lists, complaints, courts, Ones, encounters, sections, bargains, commitments, debates, Roles, Houses, causes, Capacities, mandates, Loves, answers, Tracks, Permits, projects, occurrences, experts, episodes, Commodities, levels, Phenomena, processes, Persons, Forms, Efforts, remarks, stores, claims, routes, lovers, data, orders, requests, Ideas, subjects, messages, competencies, challenges, approaches, bags, bonds, powers, needs, objectives, doubts, victims, PIES, successes, Clients, offences, Murders, Studies, scenes, places, members, Judgments, utilities, applications, licences, guys, demands, appeals, deals, controls, mergers, returns, comments, objects, examples, Toys, pipes, goods, counts, accounts, Countries, changes, concepts, types, makes, considerations, meetings, Consultants, LINEs, Resources, Areas, ratios, Inquiries, aspects, connections, Duties, linkages, supplies, enquiries, highways, ties, concerns, Bodies, Queries, women, events, media, 'af-faires, dealings, 'affaires, belongings, 'affai-res. departments, Businesses, directors, offices, relations, ministries, services. It cannot be said that Phineas and his affairs were matters of as close an interest to Lady Chiltern as to Lady Laura.
" I think you're awfully good," she said, " to take so much trouble over my affairs. 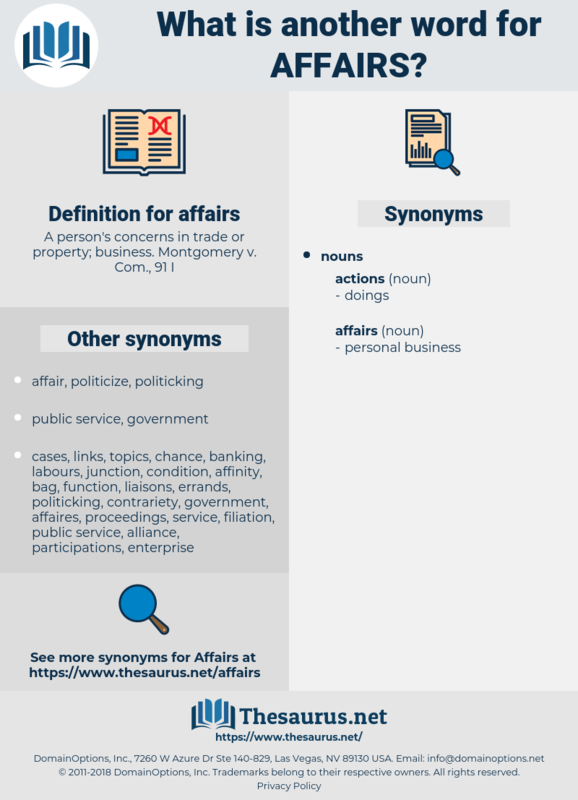 afresh, abruzzi, average, apivorous, apprize, Averroes, apprise, approach, aphorise, africa, apercu, abrachia, abrase, apraxia, avarice, apraxic, aphriza, avaricious, averse, aphorize, afro-wig, apheresis, abroach, appraise, aphaeresis, Auberge. international affairs, politics, world affairs.